Congratulations to the Yeshivah of Flatbush Model Congress team on their performance at HAFTR's "Yeshiva League Model Congress" competition. YLMC 2017 consisted of over 200 student delegates from many yeshivah high schools, who presented, debated, amended and ultimately, voted on original bill proposals, while they learned firsthand how the legislative process works. Sophomore Robert Adler received an award for the second consecutive year and Jordan Senior was recognized with an award in his first year on the team. 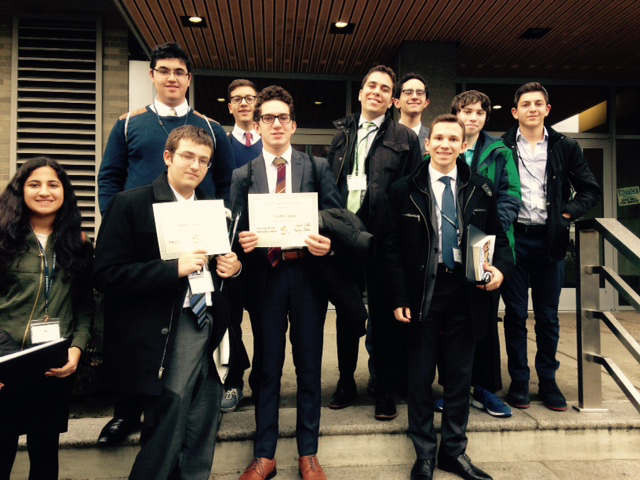 Other members included Team Captain Ben Wade, Moses Bakst, Netanel Ben-Shabat, Eli Feldman, Sarah Tessone, Joseph Edelheit, Jack H. Dweck and Joseph Ezon, who all performed at a high level. YLMC 2017 was an educational and enjoyable experience for all involved, and we look forward to future success in this program!